The Telegraph said a former vice-president of the organisation appeared to have been personally paid $1.2 million. 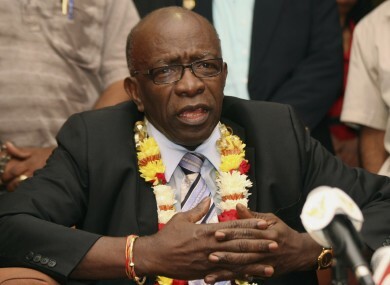 Jack Warner is alleged to have been paid $1.2 million (£720,000) from a company controlled by a former Qatari official. A FORMER SENIOR official of FIFA and his family were paid almost $2 million (£1.2m) from a Qatari firm liked to the Gulf state’s successful bid for the 2022 World Cup finals, according to a report in Tuesday’s edition of Britain’s Daily Telegraph newspaper. Payments totalling almost $750,000 (£450,000) were made to Mr Warner’s sons, according to documents seen by the Telegraph. A further $400,000 (£240,000) was paid to one of his employees. The Telegraph also said a company owned by Mohamed Bin Hammam, the then FIFA executive member for Qatar, appeared to pay $1.2 million (£720,000) to Mr Warner in 2011. The Telegraph said Warner and his family had declined to comment on their report but a spokesman for Qatar’s 2022 World Cup organising committee told the paper: “The 2022 bid committee strictly adhered to FIFA’s bidding regulations in compliance with their code of ethics. Email “Former FIFA boss paid millions by Qataris - report”. Feedback on “Former FIFA boss paid millions by Qataris - report”.